So we're both very excited to have received our first blog award from the wonderful Ire A at Voguish, and have been deciding which challenge to accept. It was surprisingly easy to choose one, although how i decided that taking a photo of myself at half nine in the morning was the best idea, I have no clue. So yes, beware you are now entering a makeup-less, hairbrush-less, shower-less zone [thank god smellyvision hasn't yet evolved]. Sleepyhead indeed. So that's my attempt to earn the Ohmyblog! award.... a twisted attempt at that. Truthfully, I was unbelievably tempted to do a little tweaking on picture editor, but in all honesty what's the point?! If I'm stupid enough to select this challenge, I may as well do it properly. 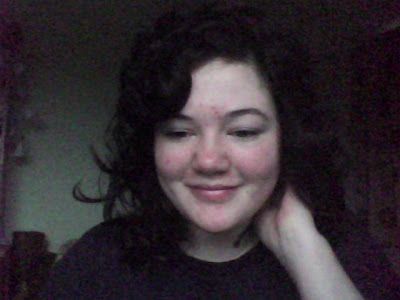 I could make a big deal about the fact that OHMYGAAH I'm not wearing make-up, haven't brushed my hair, and am fundamentally going against all social expectations of me, as a 20 year old woman girl. But doing that is just perpetuating the problem really; at the risk of sounding somewhat hypocritical (especially on a fashion blog), the choice to present yourself in a certain way is something that I believe receives far too much attention. Certainly, I wear make-up, and feel excited at the prospect of wearing my favourite clothes, but should I expect to feel out of place if i choose not to bother? The answer of course is no, but even whilst posting this photo, I am feeling a little nervous. It's as though this makeup-less face isn't the real me, but a premature me; waiting to be fixed. In reality of course, we should be proud of who we are naturally. Make-up and clothes can undoubtedly boost confidence, but that's never going to show until we're comfortable in our natural form. I suppose this challenge is my own attempt to achieve that. I'm wishing them the best of luck with their chosen challenge! I apologise now for inflicting you all with me first thing in the morning. To be fair this was taken at half six in the morning- that's how dedicated I am to you all :P As this is taken on my webcam (which is a bit rubbish!) I will also provide you with a photo taken on my camera. I warn you now, it is NOT pretty! The poor lighting here camouflagues how INSANELY bad my skin is despite all of my love and attention... I am just going to have to blame "hormones" rather than naturally bad skin I suppose! As you can probably see, I can barely keep my eyes open and as a result look completely dopey in this picture! All things considered though, without any make up, or even brushing my fingers through my hair, I don't look TOO bad especially as it was taken LITERALLY first thing this morning. It is less scary than I thought it would be, although you may disagree! Do you wear make-up everyday? Is make-up a chore or something fun that you enjoy doing? The more I see this post,the more I regret doing it!